Mick & Gilo: The Boys To Entertain You! Fast forward to 2018 & Soulstice co-founder Gilo is getting ready once again, to sock it to the Connoisseurs crowd alongside fellow turntable cohort Mick Foster. Music loving Gilo is a veteran of internet soul radio having spent time with Soul 24/7 & Stomp Radio. 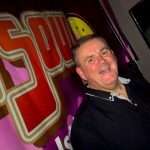 His club guest spot CV includes the Brighton Beach Parties, Brews & Soul & the Ibiza Soul Week! 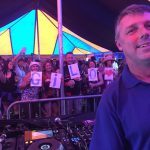 Despite stepping away from the organisation of Summer Soulstice in 2017 to focus on other matters close to his heart, Gilo is still keen to help out in the days leading up to the event & on the big day itself, including his collab on the decks with Mick. DJ Mick Foster has been a more recent addition to the event’s line-up, but he brings with him a wealth of experience from the scene. Nowadays he’s part of Luton’s Diverse FM set up, an Ofcom regulated, non-profit making, community radio station run entirely by volunteers. All the funds raised through advertising, donations & sponsorship contribute to keeping the station on the air & Mick himself, along with fellow presenter Kamal Acharya, were presented with the Queens Award for Voluntary Service in 2014. He is also heavily involved in the city’s Winter Soul Sessions as well as the Summer Soul BBQ parties in his home town & his Crown AllDayer is a gig that started 20 plus years ago & has featured many guest DJs along the way.